Time of Sowing (ToS) trials have gained momentum over the past few seasons as a way of improving grain yields by pairing the right variety and seeding date. 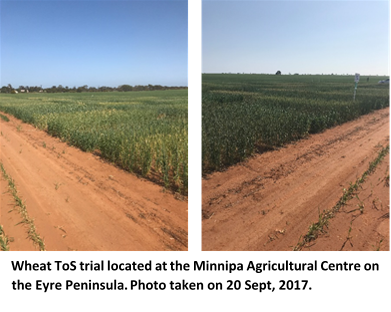 Over the next few months our regional intern Dylan Bruce is going to keep you up to date by sharing his observations from a new GRDC project. Over the past month I have been able to inspect a number of the sites involved in this research including Minnipa, Loxton, Curyo and Yarrawonga. 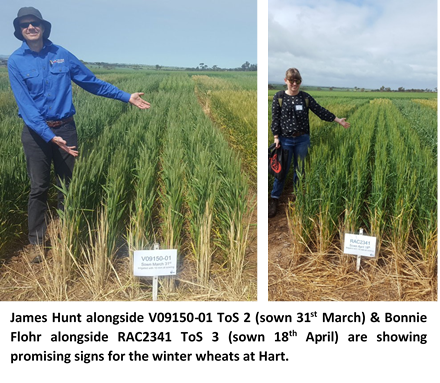 It has been great experience to see how these wheat varieties are performing over a range of environments. Across all of the sites we are seeing signs of moisture stress and some frost damage. In particular, the Booleroo site has been hardest hit with only a total of 43 mm of rainfall recorded at the site from the start of July to the end of September, compared to 89 mm at Hart. Temperatures also dropped to 0°C or below on 11 days at the site in August, 6 of which were consecutive towards the end of the month and included a recorded low of -3°C. Some of the tell-tale signs of frost damage that we are seeing in the field include bleached heads, and white coloured anthers when the florets are opened up (see images to left). We are also seeing drought tipping of heads from moisture stress, and bleached heads on plants affected by crown rot. All varieties at Hart have now reached GS65 (50% anthesis) and are heading into grain development and ripening. Below is a table illustrating which varieties at each ToS reached GS65 during the OFP (21 Sept to 2 Oct) at Hart. This is considered the period during which wheat must flower in order for grain yield to be maximised. As you can see the vernalisation requirement of the winter varieties allows for much earlier sowing compared to the springs but many are still able to flower during the OFP. Scepter and Trojan ToS 4 fell just outside of the OFP by a few days as they reached GS65 before the 21st. We are eagerly awaiting the yield and quality data however, in the meantime all bets are on! Project leader James Hunt’s pick for a winter variety suited to Hart is V09150-01 sown on 31st March. 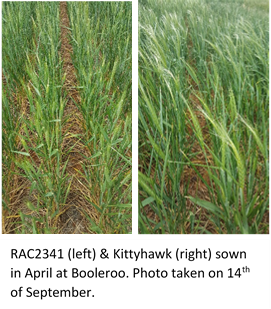 Bonnie Flohr is currently writing up her thesis on wheat optimal flowering periods and on her visit to the Hart Field Day her pick was RAC2341 sown on 18th April. My money might have to be with Bonnie on this one but we’ll see what happens. I’ll continue to update you on how the spring and winter varieties progress at Hart and Booleroo. 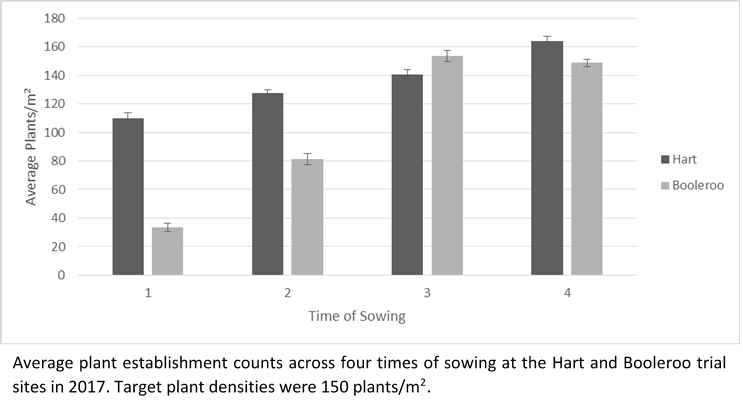 Here’s an update on how the wheat time of sowing (ToS) trial is tracking at Hart and Booleroo. All varieties from each ToS are now past GS30 at both sites. This growth stage is important as it marks a turning point in the development of wheat i.e. when a plant switches from producing leaf primordia (vegetative growth) to developing its ear (reproductive growth). The stem begins to elongate and start a period of rapid growth. This means the crop requires a lot more nutrients and the best results from applied nitrogen comes from well-timed applications at GS30-31. It also indicates that the winter varieties have fulfilled their vernalisation requirement (period of low temperature that is needed for it to initiate the flowering process) and should respond to temperature accumulation (sum of daily average temperature over a given period) and photoperiod (day length) similarly to spring varieties. Take at least 5 plants from the field to get a representative sample. Identify the primary tiller, or main shoot that emerges first from the soil and from which tillers originate. Pull off tillers, any loose leaves on the primary tiller and cut of roots at the base of the stem. Using a sharp knife cut vertically along the primary tiller making a cross-section. 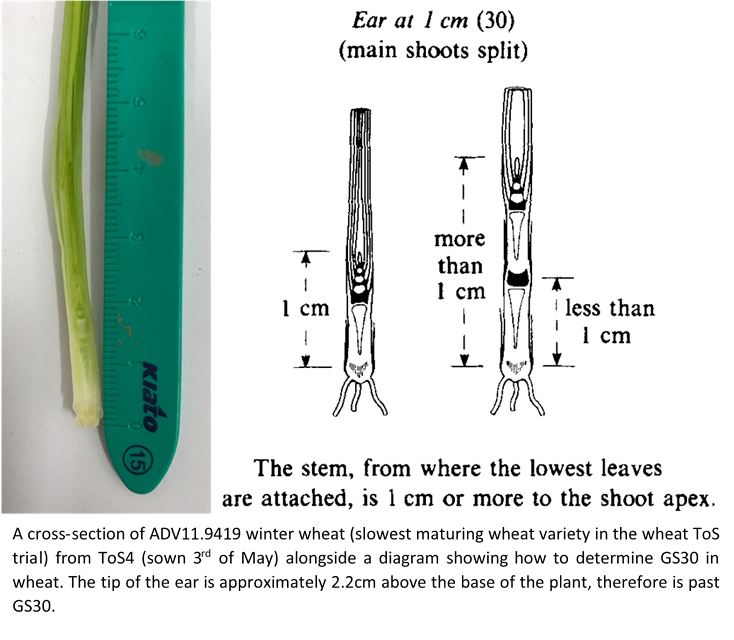 Measure the distance between the tip of the ear and the base of the plant. The plant is at GS30 when the distance between the tip of the ear and the base of the plant is greater than 1cm. One of the main challenges of early sowing wheat this year has been getting the crop established. The initial targeted plant densities for each plot was 150 plants/m², however the first sufficient rainfall wasn’t received until the 20th of April (after ToS3) which saw 48 mm fall at Hart and 32 mm at Booleroo. This had a great effect on average plant establishment across all four ToS. The establishment counts at Hart increased as the ToS became later. This is primarily due to increasing soil moisture from later rains. This was also seen at Booleroo where the top soil was very dry and air temperatures were higher during the first two ToS causing very poor germination and establishment. I’ll continue to update you on how the spring and winter varieties progress at Hart and Booleroo throughout the season. As part of my internship with Hart I’ve been busy assessing wheat variety ToS trials at Hart and Booleroo. The project involves the evaluation of 9 different wheat varieties (3 Spring and 6 Winter varieties) across 4 different ToS. Today I’ll be focussing on just 2 varieties; Scepter and RAC2341, and two ToS; 14th March (with 10 mm irrigation) and 3rd May. As you might expect the differences in growth stages between the spring and winter varieties at each of the different ToS are very obvious. 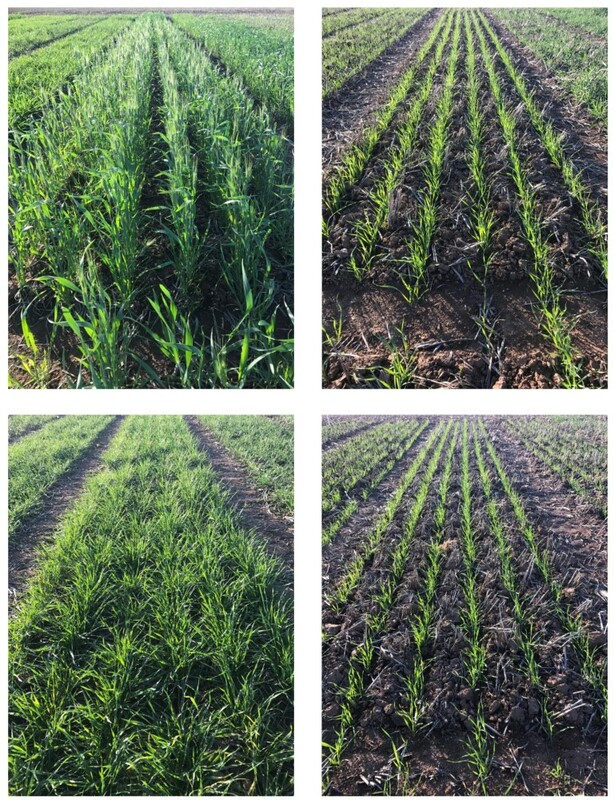 The spring variety Scepter sown on March 14 (top left image) is past head emergence and began flowering (GS61) towards the end of May. However, when sowing at a more optimal seeding time for this variety (May 3) it is only at the 3 leaf growth stage (GS13). In comparison, the winter variety RAC2341 sown on March 14 (bottom left) has only begun to reach the end of tillering (GS29) (transition from the vegetative to reproductive phase of its life cycle). This is mainly due to winter varieties vernalisation requirement, or period of low temperature that is needed for it to initiate the flowering process. Similar observations are being recorded at Booleroo, where growth has progressed more slowly compared to Hart. This is mainly due to drier initial soil conditions during the first few ToS, but it has really picked up over the last month with some much needed rain. We’ll talk more about Booleroo in the next edition.